Watch the video below to see the new appointment calendar in action. 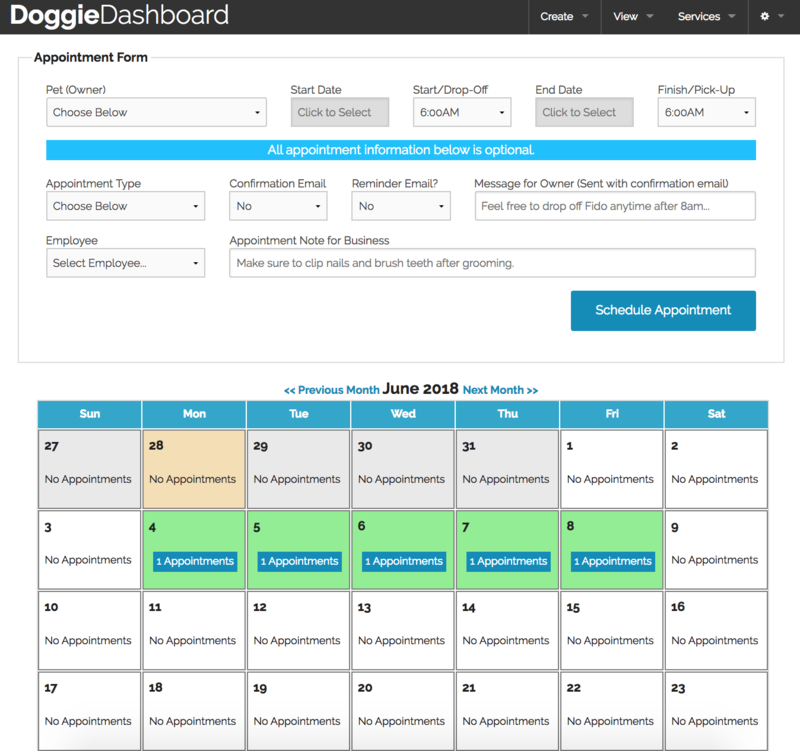 In order to remove unnecessary complexity from DoggieDashboard, users will be able to select between 5 types of appointments (Boarding, Grooming, Daycare, Training and Other). If you need to mention a special type of appointment, leave it in the "Note" section of the appointment. The appointment types are still going to show up on your Appointment Request page so that potential clients can see what types of appointments you offer. I think we can all agree that the current calendar appointment form can get a little clunky. It requires too many inputs before it lets you create an appointment. The new appointment form is only going to require the pet, the start time and the end time. Anything else is going to be additional info and will not be required to create the appointment. The current appointment calendar was coded up more than a year ago. That said, the code is a bit old and needed to be updated. The new calendar is going to allow you to cancel multi-day appointments with one click. No more erasing every single appointment of a multi-day. Now, you'll click "Delete" and the whole appointment will delete. Also, you'll be able to edit the appointment start/end dates as well. Last but not least, the new calendar is going to look great on your phone or tablet, as well as your computer. The new mobile-friendly calendar will allow you to see the entire month of appointments on one screen of your phone/tablet, without having to scroll through each day.